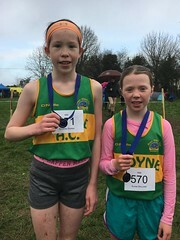 With the weather forecast predicting rain, rain and more rain, the morning of 5th June dawned bright and dry for the 8th running of the Moyne Mini Marathon. The weather held good for the majority of the 156 participants with some of those walking the 10k route the unfortunate victims of a change in the weather about an hour and a half into the event. However this certainly did not dampen their enthusiasm and all were safely back in the clubhouse within minutes of the rain coming down. At the head of affairs the race was completely dominated by Kevin Maunsell of Clonmel Athletic Club and the holder of the course record in 32.07 who surged clear from the off to open a lead on the remainder of the field and he was never threatened thereafter. The finish line this year was moved onto the track for the final 120mts with Kevin powering down the home straight to cross the line in a new course record time of 31.49. Great running from Kevin. John Fitzgibbon, Thurles Crokes led the chasing group and he maintained his form over the 6.2 mile distance to come home second in 34.27 while Michael Ryan, Dundrum broke clear of the field to finish third in 36.07. Local club athlete Liam Kelly came through for fourth in 37.02 followed by Sean Percy, Templemore AC fifth in 37.23. Sixth place went to John Dooley, Thurles Crokes crossing the line in 37.45 while just behind him came our first lady Sharon Cleere of Thurles who breasted the tape in a great time of 37.53. Dympna Ryan’s record still stands but not before a great effort from Sharon which saw her just fall short of the target of 37.04. John Fogarty, Thurles Crokes was just yards behind to finish 8th in 37.55 followed by Ken Shannon of Raheny Shamrocks 9th in 38.08. The final place in the top ten went to Seamus Duggan of Templemore AC in 39.28. Carmel Fitzgibbon, Thurles Crokes ran a great race to finish 13th overall and claim 2nd place in the Ladies race crossing the line in 38.57. Another great County athlete Aine Roche, Clonmel came through to take third place in 41.01 while Martina Ryan, Thurles Crokes finished 4th in 43.37. Fifth place in the ladies event went to Lyndsey Dooley, Thurles Crokes in 46.34 followed by two local athletes in Kate Harrison and Sharon Kiely both crossing the line together in 47.20. In 8th place was Aine Doocey, Fethard AC in a time of 48.21 followed by Mary Pyke, Moreabbey Milers AC in 49.01 and topping off the top ten places in the ladies event was Brid Quinlan of Upperchurch in 49.15. Our leading club man was Liam Kelly who finished in an excellent 37.02 for fourth place with Jody Sweeney coming home in 12th place in 38.53. Brian Kelly crossed the line in 40.16 for 16th place with Brian Carroll and Patrick Bowe finishing 18th and 20th respectively in 40.26 and 40.57 respectively. On the ladies front apart from Kate and Sharon mentioned above Lisa Quinlan finished in 49.44, Sharon Cantwell in 50.11 and Ber Spillane in 54.13. With plenty more athletes from the Moyne & Templetuohy area in action this is just a flavour of the race. The first athlete from outside of the County was Ken Shannon of Raheny Shamrocks in Dublin finishing in 9th place in 38.05. Brendan Lupton of Tullaroan AC in Kilkenny crossed the line in 24th place in 41.35 with another Dublin man Andrew Ryan finishing in 48.39 for 48th. The County of Laois got in on the act when Dominic Lawlor from Borris in Ossary came home in 59th place in a time of 51.18 with PJ Quirke of Pallasgreen in Limerick in 65th in 52.51. Lisa Kennedy of Gathabawn in Kilkenny finished in 77th place for a time of 55.29 with Brigid Flynn formerly of Moyne but now residing in Dublin crossing the line for 92nd place in 58.24. Eileen Riordan travelled from as far away as Gneeveguilla in Kerry and her tie of 1.20.29 was good enough for 132nd. Two groups – Thurles Friends of the Children of Chernobyl and the Anner Hotel Irish Heart Foundation – were also amongst the participants with all the members in each group completing the event in great style and amongst them were Donald Kennedy, Olive Fahey, Carmel Troy, Seamus Cullagh and Patricia Buckley. Our thanks to the two groups for supporting our event while raising much needed funds for their own very worthwhile charities. Many thanks to everyone for their support with athletes spread far and wide from Dublin to Kerry, Laois to Kilkenny and local areas from Nenagh to Cahir. All entrants received a medallion inscribed with the club logo and these were much appreciated by all. Full results of the event posted above and photos courtesy of Billy Loughnane are on our Moyne Athletic Club Facebook page. Thanks again Billy for your magnificent photos. Without doubt the event could not take place without the voluntary contribution from so many. From car parking attendants, road stewards, water station personnel, entry and finish personnel, kitchen staff etc. who put in so much work before hand and on the day to ensure its success we thank you one and all. Thanks to all those who donated sandwiches and confectionary etc. which were much appreciated by the participants and indeed to anyone who helped out in any way with the fixture many thanks from the Club. A great day. Delisious sandwiches , cake and beverages afterwards & all for free.